In smaller, single-family homes, apartments and condos, space is important. That’s why it’s important that utilities take as little as possible. The AquaBalance boiler unit from Weil-McLain is an ideal solution, as its sleek, compact design is small enough to fit in a closet. Yet, its high-efficiency condensing technology has the power to supply hydronic heat for up to a 2,500-square-foot home while supplying enough hot water to run two showers and a dishwasher simultaneously. The wall-mount line of combination and heat-only boilers feature an energy saving AFUE rating of 95 percent. The units combine the warmth of space heating with the convenience of on-demand domestic hot water (combi version) in a reliable, space-saving, easy-to-install package. The units feature stainless steel, titanium-infused heat exchanger technology and are ideal for retrofits or new construction in single-family homes, apartments or condominiums. The units are available in three sizes — 80, 120 and 155 mBh input — in both combi or heat-only versions. 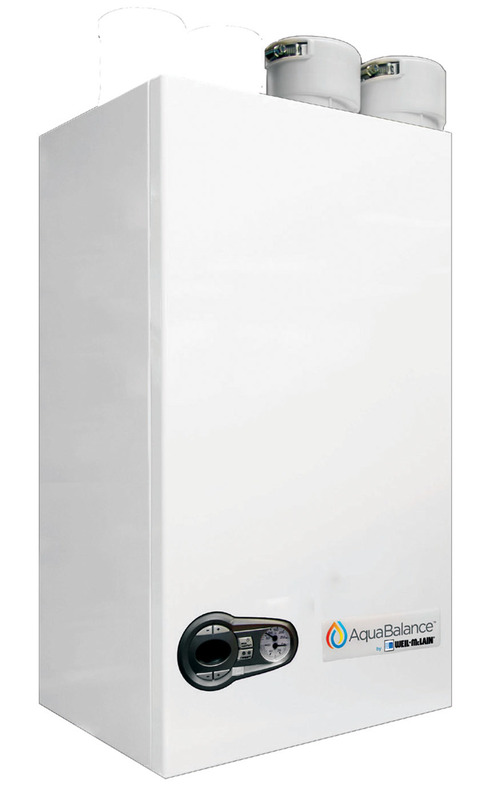 The AquaBalance 155 combi-boiler produces a constant supply of hot water up to 4 gpm. The boilers also feature an aesthetic design and simple, user-friendly controls, making installation and operation easy. The unit has a low NOx rating, easy-to-navigate boiler control with digital display, simple electrical connection points and plug-in cord, removable sides for easy service, a heavy-gauge insulated jacket for quiet operation and a three-in-one vent adapter approved to readily accept PVC, CPVC, stainless steel or polypropylene vent materials. It is able to satisfy various venting challenges and orientations, and while it ships as a natural gas unit, it is simply converted to propane with a conversion kit. 855-248-1777; www.weil-mclain.com.